The 90th Royal Agricultural Winter Fair opens this Friday, November 2, and with it, the prestigious Royal Horse Show in the Ricoh Coliseum. Opening weekend in the Royal Horse Show showcases the top-tier Canadians, with the $75,000 Greenhawk Canadian Show Jumping Championships and the $20,000 Good Crop Services Indoor Eventing taking place the evenings of Friday, November 2 and Saturday, November 3. Entries for the Greenhawk Canadian Show Jumping Championship include ten-time Olympic veteran Ian Millar (Perth, ON), his long-time Canadian team-mate Jill Henselwood (Oxford Mills, ON) and two-time defending Canadian Champion Yann Candele (Caledon, ON). Now in its seventh year at the Royal, Good Crop Services Indoor Eventing blends the skill and accuracy of show jumping with the thrill and adventure of cross-country riding. Indoor Eventing features a modified course of rugged cross-country jumps such as hedges, walls, and a bank, combined with fragile stadium jumps, whose poles and planks are designed to fall at the slightest nudge of a horse’s hoof. Penalties accumulate over two nights of competition and at the end the rider with the lowest score is declared the Champion. Although Port Perry, Ontario’s Waylon Roberts has won the Indoor Eventing title an astonishing five times out of six, he will face stiff competition. Australian Clayton Fredericks (two-time World Cup Champion, Olympic team silver medalist and just-named Team Technical Advisor (Coach) of the Canadian eventing team), tops the list. But Canadians Selena O’Hanlon (2010 World Championship team silver), Jessica Phoenix (2011 Pan-Am individual gold), Michele Mueller (2012 London Olympics), Diana Burnett (2008 Olympic alternate), Ian Roberts (2004 Olympian and father of Waylon) and Penny Rowland (2003 Pan-Am team silver) will be looking to make their mark this year. Opening Sunday, November 4, brings the action-packed Ontario Toyota Dealers Royal Rodeo to the Ricoh Coliseum. Bull riding, bronc riding and barrel racing are the highlights of this exciting afternoon – you won’t want to miss a moment! Amber Marshall, star of CBC’s Heartland, will be co-hosting the Rodeo. Following opening weekend, International riders will compete between Tuesday, November 6th and Saturday, November 10th, in matinee and evening competitions including Tuesday’s $32,000 Jolera International Welcome, Wednesday’s $100,000 Hickstead FEI World CupTM Grand Prix, Thursday’s $32,000 MNP International Top Score, Friday’s $50,000 Weston Canadian Open and the hottest ticket in town – closing night’s $75,000 Ricoh Big Ben Challenge. All weekday matinee performances in the horse show are FREE with general admission to the Fair. 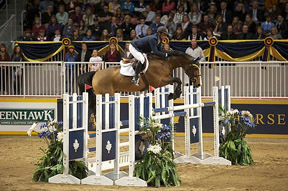 Thursday evening’s performance offers an exciting double-bill featuring International show jumping as well as the $20,000 Dominion Regalia Royal Invitational Grand Prix Dressage Freestyle to Music competition, where Canadian Olympian Ashley Holzer will appear to defend her multiple titles.